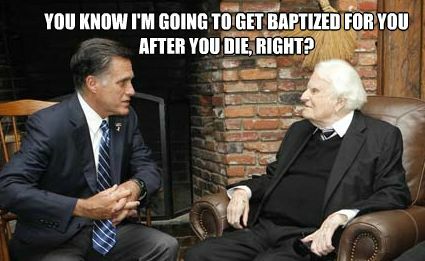 If Mormonism is not a Cult, then Mitt Romney and the Mormon Church owe Billy Graham an Apology. As I predicted, the secular media, and Mormons in particular, have taken advantage of Graham’s actions. I have read reports ranging from claims that because Graham took the “cult” label off of Mormonism, he is treating people the way he would want to be treated, to claiming he must no longer believe that Mormonism is a cult. Let’s assume for the sake of argument that Billy Graham no longer believes that Mormonism is a cult and he has removed the cult label to be nice. If that is the case, then Mitt Romney and the Church of Jesus Christ of Latter-day Saints owe Billy Graham an apology. Why? Because it is hypocritical for Mormons to accept their new endorsement, yet still maintain what they really think about “other” Christians. Earlier this year I wrote an article on our website titled, Mormonism’s Hypocritical Attack. I will rephrase some of what I wrote then and apply it directly to Billy Graham. Keep in mind that these choice quotes are from Mormon authorities ranging from the Book of Mormon, to Mormon prophets Spencer W. Kimball and Joseph Smith, the founder of Mormonism. What do they really believe about Billy Graham and the type of Christianity he represents? Please put on your seat belts and put your seat backs and tables in their upright and locked positions. We are about to experience some expected turbulence. – Billy Graham’s religion was hatched in hell. –Billy Graham’s Church is the Church of the Devil. – Billy Graham’s Jesus is mythical. – Billy Graham’s Trinity is a monster. – Billy Graham’s creeds are an abomination. – Billy Graham’s grace is a fallacious doctrine originated by Satan. – Billy Graham is presumptuous and blasphemous for performing marriages and offering communion. – Billy Graham is damned. – Billy Graham has no right to preach the gospel. – Billy Graham is not a true Christian. Those last three just kill me. If you can believe it, I went into more detail with these quotes in the original article. Don’t bother to tell me that these quotes are inaccurate or taken out of context. References are included on my original article so you can check for accuracy and context there. If, by chance, a Mormon claims that some of these quotes are not official, please just answer this question. Do Billy Graham and Christians like him need official insults before we can be offended? The Grahams are giving people the false impression that salvation may be had through Mormonism’s message of a false God, false Christ, false Scripture, and false means of salvation taught by a false prophet. The outcome of the election is not as important as people’s eternal destiny. We must not sacrifice the essentials of saving truth for any temporal matter. This is most disappointing. Hard-hitting but seemingly needful. Mormons need the righteousness Christ alone affords all those whose trust is in Him alone. I am not a Democrat, liberal or an Obama supporter but as Jon Stewart rightfully stated, Conservative or Republican Christians hate Obama more than they love Jesus. We are continually moving towards the last days and people don’t know right from wrong, as the Good Book says. God helps us! A quick, first reading of your article leaves the impression that each statement was a quote about Billy Graham. It took digging into the original statements, that you made people take the time to look up, to see how you reinterpreted what was said. It would be impossible to have Joseph Smith and the Book of Mormon directly address Billy Graham. I also left the references out for a reason. I *wanted* people to go to the site and see the original article as it has more quotes. Thanks for taking the time to do it. That says a lot about you. You did a good job of making it easy for those who will take the time to look up a link, the link to your article that agreed with you. I also noticed that you chose not to do the same for the LDS writings you quoted, even though many of the things you quoted are available free on line. When I wrote the article, I simply didn’t have time to hunt for which ones are online and which ones are not. To be honest with you, I still don’t. I just wanted to get the article up. However, if you want to email me the links to the quotes, I will take the time to insert them into the article. I also wanted to have it set up so that when someone clicks on the reference number in the body of the article, it takes them down to the reference itself on the bottom. From there, it would be good to have the reference go to the place on the web where it is found. I’m not against people having the resource. They vindicate me. I just don’t have time to do the tedious stuff right now. The problem with each, if your reading was not “careful,” comes from the desire to “just … get the article up,” A puzzling response considering Keith has an entire website devoted to conveying misrepresentations of “Mormon” doctrine, begging the question, ‘What else would create a draw on his valuable time?’ And of course a plea to the ever authoritative, ” … Jon Stewart rightfully stated …” by Jam. Nevertheless, going through the list and evaluating each of the sources of Keith’s various contentions, it becomes apparent he is taking extensive creative license with the subject matter from which he draws support for his inaccurate conclusions. Extant of any foundation upon which to base a correct understanding, several, if not most of the statements, with the remaining being a gross misrepresentation, are incorrect. By way of example, and “to get the article up” I will consign my response to only a one of the selected “turbulence” causing statements. The problem Keith and Bill have in their view of the “Jesus of the Bible” is a shortsighted desire to tell God what He is, by applying the Trinitarian Creeds, rather than read scripture and have his nature revealed. When the conclusion is reached before the information has been read, or revelation received, an accurate understanding of God is difficult to have. The Zoramites portrayed in the Book of Mormon had a similar dilemma (Alma 31:14-21) That said, most “Mormons” who correctly understand their theology, believe the idea any professed “Christian” is damned, when applying a “Christian” definition to the term, is erroneous. We understand and accept, some of God’s Children will be deceived and as a consequence receive an appropriate reward in harmony with their capacity, desires and knowledge. The scriptures, specifically the New Testament, are replete with examples. (John 14:2, Matthew 5:19, Mathew 18:1-4, Luke 19:12-26, Matthew 13:43, Matthew 25:14-34, James 1:9, Matthew 16:27, 19:28, 1 Corin. 15 etc.) Each of us will be judged according to our works (Alma 12:12-17, Matthew 5, 7:2, 12:36, James 2) and the desires of our heart. If you had really written the original article, as your byline implies, you would have had all the sources at hand and easily availed for sharing:———– if you really were willing to have people check your work and your references. As it is, it looks like you only want people to blindly follow you and not to have anyone question your conclusions and beliefs.